Roasted: Spread 1 layer of Pine Nuts on a cookie sheet. Place in an oven at 250 degrees for 12-15 minutes. Serve in a bowl like peanuts. Trail Mix: Roast Pine Nuts as above. Add to your favorite trail mix or nut mix. Mashed Potatoes: Brown Pine Nuts to a golden brown in butter, stir constantly for even browning. 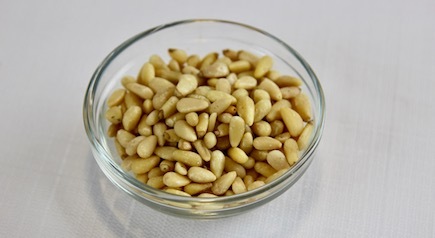 Use 1⁄4 cup Pine Nuts for 1⁄2 gallon or 4 lbs. of mashed potatoes. Use 1 Tbls. of butter for 1⁄4 cup Pine Nuts. Stuffing: Use 4 cup for 5 lbs. stuffing. Lightly brown the Pine Nuts in 2 Tbls. butter, then mix into uncooked stuffing and cook as usual. Pasta: Add roasted Pine Nuts to any white sauce. Mix into fillings for meat or cheese ravioli. Use 1⁄4 cup of Pine Nuts for every 1 Lb. of Pasta. Use 1⁄4 cup of Pine Nuts for every 5 Lb. of ravioli filling. Omelets: Add 2 T Pine Nuts browned in butter to 3 beaten eggs. Use the Pine Nut egg mixture for your favorite omelet. Rice: Improve any rice dish by adding Pine Nuts. Use 2 T Pine Nuts browned in 1T butter for each pound of rice.